The Doctor Who Christmas Specials are some of the most unique beasts in the entire television kingdom. The episodes play a role in the ongoing narrative without necessarily being directly related to it, and bare little resemblance to a typical hour of Doctor Who in the season proper. 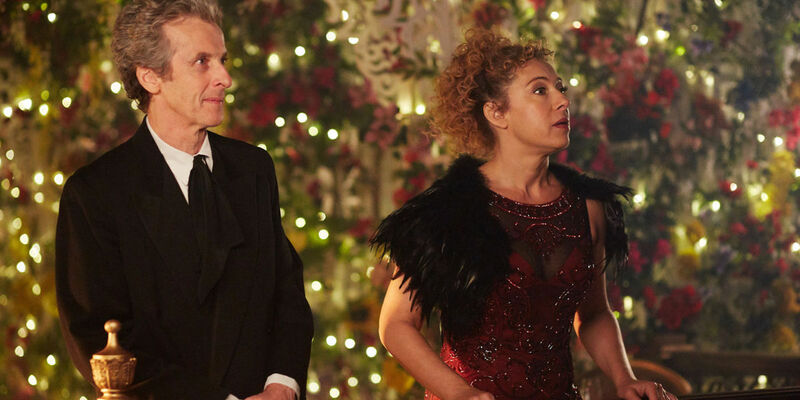 Some, as in the case of this year's 'The Husbands of River Song' can be a little madcap and unconventional, and have a tendency to swing wildly from one end of the emotional spectrum to another, like your drunken uncle experiencing what the family has dubbed his "Christmas episode." In other words, it's a holiday tradition that sometimes makes absolutely no sense, but you love it anyway. 'The Husbands of River Song' is unabashedly representative of the best and the worst of those broad emotional strokes undertaken during this festive hour of television. The episode is deliberately lighthearted and amusing and it often goes to great lengths to remind the audience just how lighthearted and amusing it is. Mostly, though, the hour feels as though it's simply amused with itself, holding out a hand just in case anyone watching would like to come along for the ride. There's something charming about an hour of television that is so bemused by its own spectacle it doesn't have the wherewithal to try and force the audience to do the same. That's not to say the special doesn't work by using the broadest strokes possible, because it really does; it's just that, for the most part, the episode doesn't feel like those strokes are intended to convince the audience of anything – well, at least not during the first two thirds, anyway. This is the advantage and disadvantage of the Doctor Who Christmas Specials: they are written for an audience that is probably only half paying attention anyway. Sure, there are plenty of those watching who want the full Doctor Who experience, and they may even get it, but, in general, the hour has to be two things: a pleasing hour of a long-running television series and something evocative of the season that is demonstrably lighter than the meal most viewers are digesting at the time. The push-pull of requisite holiday buoyancy and the potential weightiness of Doctor Who-style adventure are most evident in the episode's early goings. Dropping the Doctor into a human settlement in the distant future, to be greeted by the face of Matt Lucas needing a "surgeon" before being dragged into the company of River Song (who doesn't recognize him) makes for a suitably playful setup. Obviously, the history between the two is enormous and Moffat is certain to help his audience recognize its importance, stopping just short of diving headlong into a flashback or a lengthy discussion of something like 'The Angels Take Manhattan' – though when the word "Manhattan" is uttered, it lands with a kind of resonant thud. This isn't the only time 'The Husbands of River Song' plays its hand in such a way. As such, the episode's relatively lighthearted escape from the clutches of King Hydroflax (Greg Davies) and then a brief excursion aboard a luxury spaceship filled with some of the universe's worst is eventually beholden to the idea of closing a very specific loop in the Doctor's timeline, wrapping it up with a big red bow of human emotion and a sprig of holly for effect. In between, the episode manages to decapitate several people – including Lucas and Phillip Rhys – though they only seem mildly put out by it, since their heads continue to live on inside a giant red robot body that can do… stuff. The decapitations are weird for a holiday special, but then again, the hour doesn't really have much in the way of overt references to Christmas. There are several visual allusions, like the gag in the very beginning with the Doctor wearing a goofy pair of novelty antlers, and again later on when the Doctor meets River at the restaurant overlooking the Singing Towers of Darillium, but, for the most part, the hour feels only tangentially related to the holiday. And it works, since 'The Husbands of River Song' is more interested in providing an emotional payload from the series' earlier installments via the very specific delivery system that is Peter Capaldi and his version of the Doctor. Moffat uses River's inability to recognize the Doctor to great effect, as it lets the Doctor, and by extension the audience, see River Song in concentrated form. It's a little voyeuristic and maybe unfair, but it offers a great shortcut to heart of the character, so that when she finally realizes she's in the presence of someone she loves so much, but is convinced those feelings are not reciprocated – saying, you "don't expect a sunset to admire you back" – only Capaldi can deliver the sort of line that is as much a payoff for River as it is for the audience. "Hello, sweetie," isn't the sort of thing you'd expect Capaldi-Who to say – especially after the season he's been through – so when he does, it effectively presages the emotional turn the episode is about to make. For all its grand silliness with regard to decapitations and a rare jewel stuck in Hydroflax's noggin, 'The Husbands of River Song' requires the audience pay attention in its closing minutes. As that is the case, those who indulged in a little too much spiked eggnog and whatever else, or don't have encyclopedic knowledge of Doctor Who's many story lines, may not necessarily put all the pieces of the Doctor and River's last night together. But, as it's written, it doesn't really matter. Like he did with the "sweetie" line and laughing at Hydroflax's head in a bag, Capaldi manages to convey the appropriate emotional tenor of the moment without making it too melancholy or maudlin. This season has been met with one humdinger of an ending, so for the Doctor to face down yet another, as River's timeline with him comes full circle, there's a tendency to wait for a "loophole" to present itself. And it mostly does when the Doctor mentions a night on Darillium lasts 24 years, but there is still a hint of finality that resonates far more pronouncedly than anything else during the episode. As with Clara's departure in the season finale, this moment marks the end, but it is an end that won't come for a very long time. Like when River displays the images of all the Doctors or mentions the entries in her diary, there is the hint of a massive story that has been overlooked, something incredible that has yet to be told. That same feeling was elicited when Clara and Ashildr darted off into space in their stolen TARDIS. This likely isn't the last time the show will actually feature River Song, but knowing that doesn't necessarily lessen the blow of the moment two characters realize they've reached the end of the road together. Endings are hard, even for a Time Lord and someone as crafty as River. This isn't the end of either, not really, but that's ultimately not the point Doctor Who is trying to make. Instead, it reveals itself to be focused on the idea of what "happily every after" means in the context of a nonlinear life like the one lived by the Doctor or River. Like Clara's death, their "last night" together is a fixed point in time that cannot be avoided, but even the Doctor's inability to ultimately circumvent such an occasion doesn't prevent it from becoming an opportunity for their definition of "happily ever after" or to come to fruition. Doctor Who will return in with new episodes in 2016.